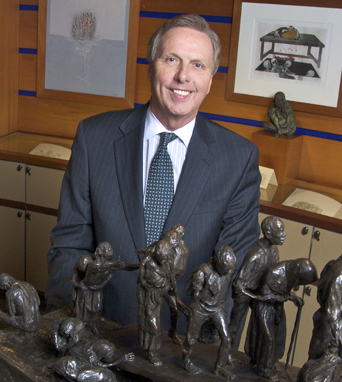 President of Quinnipiac University in Hamden, Connecticut for over 25 years, Dr. John L. Lahey is as dedicated to leadership and education as he is to his Irish ancestry. The Quinnipiac campus, its unprecedented Ireland’s Great Hunger Museum, and Dr. Lahey’s work with the New York City St. Patrick’s Day Parade Committee are all testaments to his exceptional commitment and vision. Born and raised in the Riverdale section of the Bronx, Dr. Lahey has roots in Co. Clare on his mother’s side of the family, and in counties Cork and Kerry on his father’s. His paternal grandfather, a stonemason, emigrated from Knockglossmore, Co. Kerry to Canada, eventually settling in New York. At the University of Dayton in Ohio, Lahey discovered a deep interest in philosophy, earned his bachelor’s and master’s degrees in the field, and met his future wife, Judy, with whom he has two sons. Following his time at Dayton, he went on to complete a PhD in philosophy at the University of Miami. In 1977 he returned to New York and earned a second master’s degree, in academic administration, at Columbia University. He was hired by Marist University in Poughkeepsie, NY, where he became chief operating officer and executive vice president. At only 40 years of age, he became president of Quinnipiac. When he started at Quinnipiac in 1987, it was still Quinnipiac College – a small, quiet commuter school with one campus, an endowment of $5 million and an application pool of 1,000. Today it has a student population of over 8,000, with close to 6,000 undergrads, 2,000 graduate students, and 500 enrolled in the law school, which was established under Lahey’s lead. The university now runs three campuses, has an endowment of $277 million, and applications for the incoming class exceed 19,000. Lahey has also had a hand in the establishment of the highly regarded Quinnipiac Polling Institute, and the Frank H. Netter, MD, School of Medicine, which will open in 2013. The accomplishment closest to his Irish roots is the creation of Quinnipiac’s Ireland’s Great Hunger Museum, which seeks to commemorate the people who either died or fled Ireland during the famine, and to educate the public about An Gorta Mór. The focal point of the museum is the extraordinary Lender Family Special Collection. Founded in 2000 following a donation from Marvin and Murray Lender, the collection contains 700 volumes, historic and contemporary texts, and an ever-growing number of works of art that portray or respond to the loss of more than 1.5 million Irish lives between 1845 and 1852. These include pieces by contemporary artists Padraic Reaney, John Behan, Rowan Gillespie, Glenna Goodacre, and period pieces by such artists as James Brenan and Jack B. Yeats. Away from Quinnipiac’s campus, Dr. Lahey is a director of the United Illuminating Company, Independence Holding Company, Yale-New Haven Hospital and Alliance for Cancer Gene Therapy. In addition, he is vice chairman of the New York City St. Patrick’s Day Committee and has been involved with the committee for over 25 years. In 1997, he was honored with the role of Grand Marshal.